I purchased this at Logees Greenhouse to my annual trek there in February, 1997. I didn't look all that closely at the label. Now that I have it home, I see that it's clearly mislabeled. They called it A. sanderiana, but it's obviously not that. 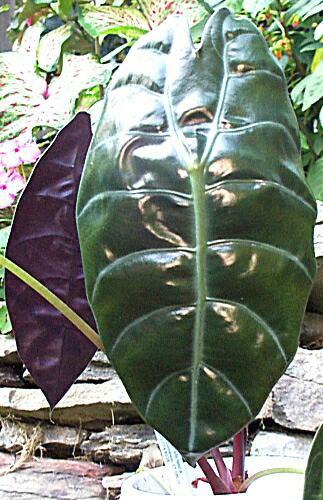 The leaf is shaped like cuprea but is greener in color and doesn't have that metallic sheen. Alocasia chantrieri was offerred as one potential ID. I then received another suggestion of Alocasia sedenii. In comparing the two, I now believe that A. sedenii is the more likely choice. I imagine that the mislabeling just involved someone yelling out to another about the proper ID when labeling the plant at the greenhouse. The person doing the labeling probably wasn't familiar with sedenii, her the "sed" and assumed it was sanderiana. New leaves are just coming out now in July, 1998. The leaves when fully open will be photographed and uploaded..